Mr. Connor began tap dancing at the age of 6 under the guidance of Robyn King Edgar. Over the course of the years that followed Connor learned many dances and how to perform in all styles, tap easily sticking out as his favorite class. His passion and love of the art was discovered at the age of fifteen, when introduced to Mackenzie Greenwell who provided additional private classes and summer workshops. Connor’s favorite aspect of tap is the beautiful spontaneity and unpredictability of improvisation which his strong drumming background, jams with dancers from around the world, and hours spent on plywood have all had a heavy influence over. Currently training with Tasha Lawson’s company “Tri-Tone Rhythm Ensemble,” Connor is provided with both opportunities to work with artists from around the globe (Dianne Walker, Danny Neilsen, Derick Grant, and Valeria Pinheiro to name a few) as well as performance opportunities; most notably The Vancouver International Tap Festival, Third Coast Rhythm Project (San Antonio), and Calgary’s own Rhythm, Body and Soul. 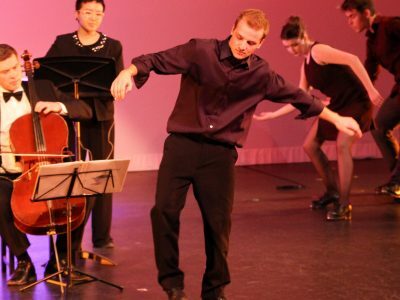 When Connor is not busy teaching dance, training, or attending classes at the University of Calgary, you can find him in a jazz club downtown or in a friends basement full of musicians jamming, creating, and exploring. Planning to continue learning and teaching tap as he grows old, Connor hopes to inspire many others to do the same.